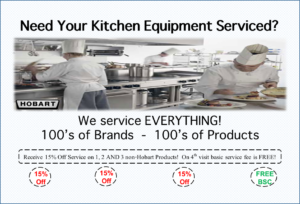 Looking to get your food equipment fixed? Or maybe you’re in need of some new equipment or expanding? We offer Predictive Wireless Sensor Maintenance, New Customer Discounts, Local First Offers and for the Tri-City area a service punchcard and discount card. Find all of our latest promotions here! Tri City Area* Service Discount – Print your punchcard below!